Ethne and I are always on the lookout for thrifty options! OUR MOTTO IS CHEAP! CHEAP! CHEAP! Just yesterday, I was explaining to Ethne how fantastic PRICELINE is and she had no idea! She said, “You must tell our followers!” First up, I am not getting paid to endorse Priceline. But what I can tell you is that it has cut our hotel costs in half if not more. For example, Steve and I are headed to the cities this weekend for a wedding (YIPEEEE! THIS EQUALS QUALITY TIME WITH MY ETHNE). Our very good friend (and former roommate) Nick is getting married and we are thrilled. Steve is actually singing in the wedding. Who knew that our karaoke skills (Steve rocks karaoke) could turn him into a wedding singer? Of course, we needed a hotel room for two nights in downtown St. Paul. I called the “recommended” hotel on the invite, and they were asking a whopping $150/night. WAY OUT OF THIS WOMS BUDGET! I typically never shop for a hotel directly anymore, but we thought the convenience might be worth it. But we were wrong. I asked Steve, and we both agreed that a Priceline Hotel room is a MUST! (We could take a cab to the hotel if needed and we would still save major money!) A quick log onto Priceline—$40.00 later (per night) and I had a highly rated hotel (very nice I might add) in downtown St. Paul. That is a $220 savings! And it was super easy! My bid is in...now I am waiting to see if I WIN!I find the longer the "negotiator" takes, the better chance I have at WINNING! 1. 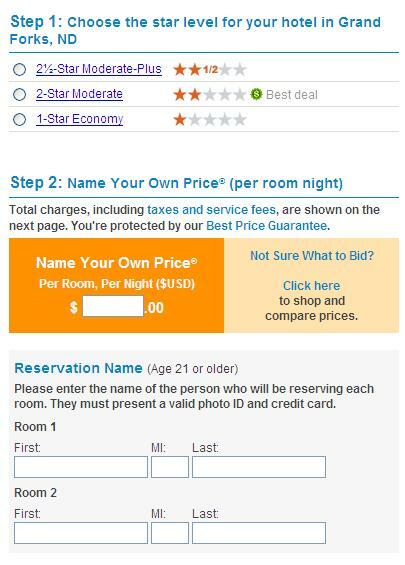 When bidding, you are technically signing up for a room with one bed (they assume it is two adults). This works perfect for Steve and I now because Mur-Man doesn’t require a bed. However, I have assisted a co-worker with Priceline and they were able to book a room for a family (a simple call to the hotel to put in the request (after the room was booked) and it worked!). However, you are taking a gamble by doing it. 2. Each time you bid—you must go up by $5.00. I typically start low (but not too low, because you do not want to run out of options). I started at $35.00 in downtown St. Paul and only had to increase my bid one time. 3. 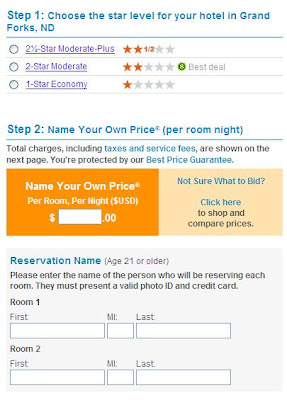 Each time you bid you have to either change your star rating for your hotel or your check-in and check-out dates (along with the price). Don't run out of options. 4. Make sure you print a copy of your receipt for documentation when you arrive at the hotel (remember: your room is already paid for).